How can a simple drawing idea involve intrigue and mystery? And why should you even care about them in your art? After all, you want to be an artist, not write science fiction. Well, I'd like you to consider something. Really successful people are often the ones who approach life with an open mind. 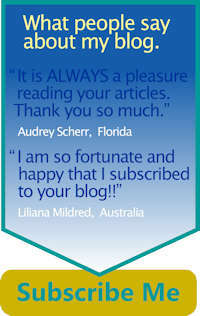 They are able to learn valuable lessons from many different sources. For most of us it is much too easy to unconsciously get locked into a certain way of thinking or doing things. I've noticed this condition when I do crossword puzzles. At times a particular clue may utterly stump me. Not because the answer is really hard or obscure. It's that my mind gloms onto ONE answer. It's the WRONG answer, but my mind won't let go of it. That's when I need to go do something else. Allow my subconscious to clear the roadblocks. Then, when I return to the puzzle, the answer is often obvious. With that in mind let me offer a simple drawing idea that should be part of every artist education. Learning a few lessons from someone like Agatha Christie could be good for your art. 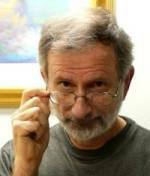 Face it, intrigue and mystery are the linchpins of all good mystery writers. Creating those qualities draw you into the story. They keep you eagerly reading page after page. They keep you guessing as to who the villain is. Imagine what would happen if the writer told you everything on the first page. Yet, that's exactly what many beginning artists do in their art. One of the best drawing hints and tips I can offer you is: Don't get locked into the idea that everything should be completely defined. Like this apple. As drawings go, this is a fairly accurate rendering. I could have gotten even more detailed. I could have spent more time defining every last variation in tone. But would that have made the drawing more interesting? This all important question is a simple drawing idea to comprehend. The whole point of doing art is to make it interesting. I could have added color to the apple. That helps creates a little more interest. 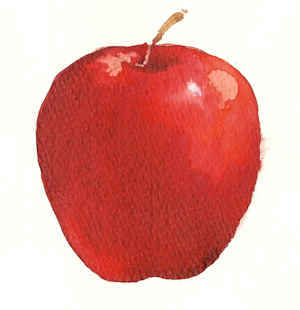 And makes this a nice enough watercolor of an apple. Again I could have spent more time painting every last detail. Every last variation in tone. But would that have made this watercolor more exciting? Like in the pencil sketch, asking yourself this question is one great painting tip for the beginner. You only want to include what brings more excitement to the art. This problem of how much to define becomes an even bigger problem when there are many objects in the art. Like a landscape or still life or even a portrait. Too often a beginning artist tries to perfectly define everything. Instead of asking themselves, "Will defining this make the art more interesting?" Will it add intrigue and mystery? Or will it just be like telling the viewer too much on the first page? P.S. 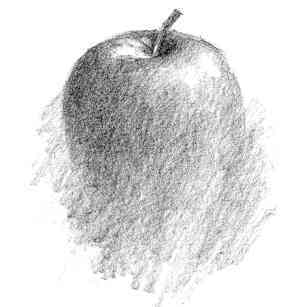 So how do you begin to introduce a little intrigue and mystery into something as commonplace as an apple? Or almost any other subject you would want to draw or paint? Because almost every subject you would ever want to draw or paint is fairly commonplace. Practically everyone has been seen it. Hundreds of times. They know exactly what it looks like. A big part of your artist education is discovering how to make your art worth more than just a passing glance. How you are going to add a little more intrigue and mystery to your art. 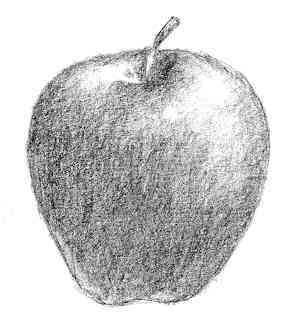 One very simple drawing idea that begins to answer that question is in this last apple. Know what that ideas is?